Now THAT is how you do a Season finale! Tons of questions answered, heart-racing and hilarious action, shocking yet explainable twists and an altogether self-contained storyline that stands firmly on its own while still leaving a small post credits to hint at future adventures. The Ducktales Season Finale did it better than most ‘adult series’! 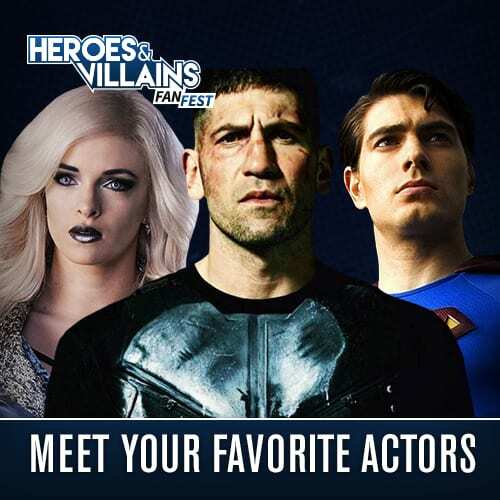 Many TV shows usually have a villain problem. 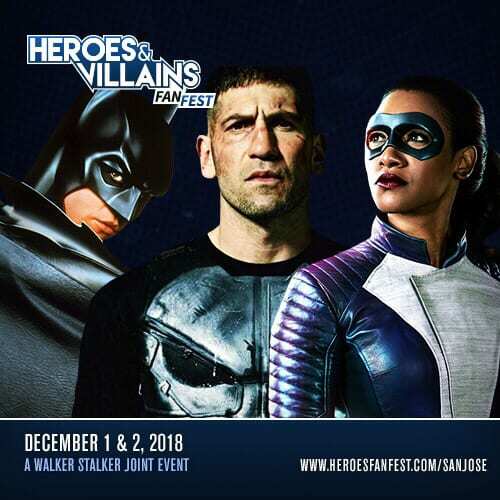 Either the villain isn’t charismatic enough, scary enough, or the audience has just seen so much of them that halfway through the season they wonder ‘how is this still a thing?’. Ducktales took an incredibly unique approach to this. Whereas other shows have two types of episodes: (1) those that deal directly with the main villain storyline and (2) those that seem like filler but have a small tie in to the main villain storyline, Ducktales had multiple storylines. Through the season, we had episodes that contributed either directly or indirectly to the Gizmoduck story, the Della story and the Magica story. By having these 3 storylines, Ducktales kept things fresh so that when Magica finally made her entrance, the audience wasn’t tired of her. And WOW what an entrance it was! Frightening yet funny, charismatic yet completely bonkers, and both showing concern and disdain for Scrooge. Everything about Magica’s design, mannerisms and voice (portrayed by the wonderful Catherine Tate) was spot on! This finale showed full well why SHE above all others was Scrooge’s true nemesis/ rival. If you’re a Doctor Who fan, then you’re already familiar with how good David Tennant (Scrooge/ 10th Doctor) and Catherine (Magica/ Donna) are at playing off each other. This finale not only gave us multiple chances to see that, but – best of all – kept Magica alive! By episode’s end, she lost much of her powers but can still be considered a threat. If anything, the Magica we’ll see from here on out should act a lot closer to the Magica we knew from the old series who relied more on potions and spells rather that pure arcane magic. 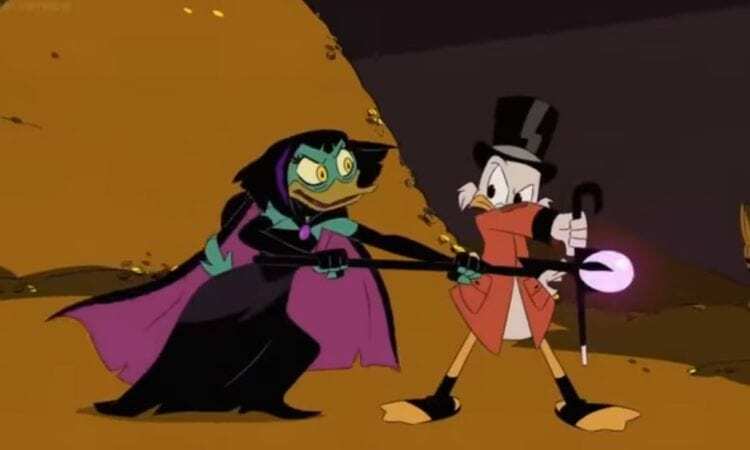 Though all-powerful or not, keeping Magica around was a great choice because she did what Glomgold, Beaks and Ma Beagle never could in this show… be funny while remaining an actual threat! Did you for once think any of the other villains would succeed? No! Magica on the other hand kept us guessing till the last moments. And who knows, perhaps the writers can play with the Scrooge/ Magica-ship idea. At much as they fight each other, they do both oddly respect the other (ie: Magica referring to Scrooge as the “shrewd, conquering hero of legend”). I started to mention last episode how the Della flashbacks gave a ton of character development and background to Donald Duck. Thankfully, even if you didn’t notice the subtleties in last episode’s flashback shots of Donald pushing the stroller, the finale took time to point it out. During Webby’s and Launchpad’s ‘Parent Trap’, we hear the nephews talk about how their Uncle Donald is truly devoted to family and always did what’s best for them. Having Donald get this verbal confirmation was really sweet, but it was nothing compared to the character development to come. The fact that it was Donald to say “Our family has been apart for too long. It’s time for us to come together” speaks volumes. As I said last episode, the reason why Donald rarely – if ever – took part in adventures this season is because he truly has sworn off them and hasn’t fully forgiven Scrooge. And to an extent, he probably hasn’t fully forgiven his sister either for running off with the boys due any day. So having Donald be the catalyst to say ‘enough is enough, let’s put the past behind us’ was big. Probably one of the greatest achievements of Ducktails outside of the series itself is what it’s done for the CHARACTER of Donald Duck! He’s always been the short tempered duck; but this series has given him loads of depth and now the epic and inspiring Don(ald) Cheadle as voice actor! And to be honest, Donald needed to have a voice this episode. It allowed us to see his leadership skills as well as get some incredibly epic one-liners and fight scenes. Hell, Donald even defeated Shadow Gizmoduck! “Wait, where’s Dewey!” / “No, right here. Not stealing the boat” (Donald / Louie) – This was a fun throwback to the Season Premier where Dewey stole the boat and caused them boat to get wrecked in the first place. 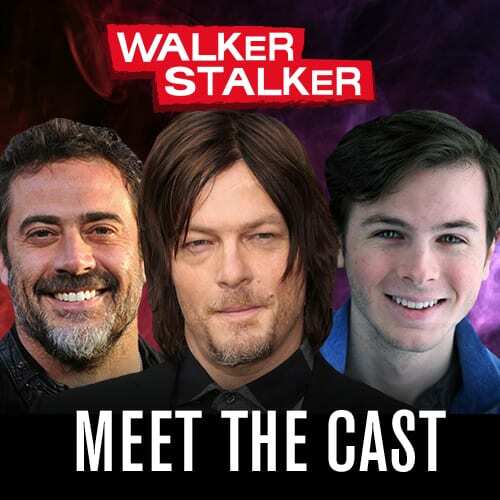 Also, like the Season Premier, this was also an hour long. Everyone taking the stairs in the Money Bin was a reference to Episode 03, where Louie kept having to take the stairs. “My family is good for nothing. Your family is amazing!” (Lena) was a great throwback from Lena who initially felt in Episode 4 that family was good for nothing. We had hoped she’d see the light and turn this around, and she finally did! Once again, we find Donald’s lucky brother Gladstone to be the luckiest Duck alive – which we learned in Episode 6 – as he not only finds another $20 but also has a friendly interaction with his evil shadow. Having the episode start off with the theme song rather than a small set up scene was a nice touch considering how somber a note the last episode left off on. Cape Suzette is the second Easter Egg we’ve gotten from Tailspin this season! This marks the first time we’ve really seen Laucnhpad and Webby interact; and they’re awesome friends! It’s also a nice touch that Webby overpowered Launchpad with the chest bump. HA! Mrs Beakley made a “Parent Trap” reference. Yay another Darkwing Duck Easter Egg! This time in bobble head form! The battle on Mt Vesuvius was actually a wonderful reference to Magica’s age-old ‘canon’ reason for wanting Scrooge’s Number One Dime. 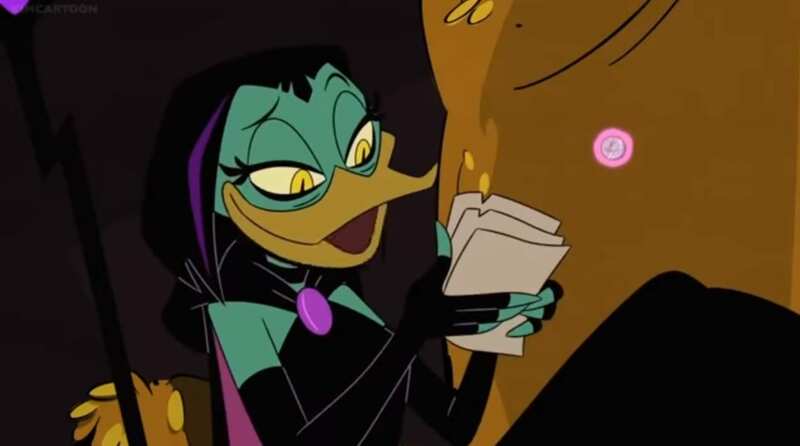 Whereas this season she wanted it because she was trapped in it (btw, nice touch keeping the back side with her image hidden for so long), she mentions that her original reason for wanting it was because it was a ‘token’ of the McDuck clan’s good luck and fortune. Not that it was lucky itself, but rather represented their luck. Did you notice Mrs Beakley saying: “Hey, what’s the big idea?” and “Aww phooey” when fighting the shadows on the boat? Yup, those were both Donald references as those are two of his most used lines when he’s upset. We saw just about everyone’s shadow even if the character his/herself wasn’t present. For example, the Beagle Boys’ shadows appear in the money bin fight. Where will this show go next Season? Who knows, but I’m excited to find out! The attention to detail the writers, animators and cast have put into this show is absolutely stunning. I wholeheartedly trust their process and you can count on me to be here to “un-pluck” all the latest Ducktales news, theories, episodes and Easter Eggs! Why? Because “Ducks don’t back down!”!